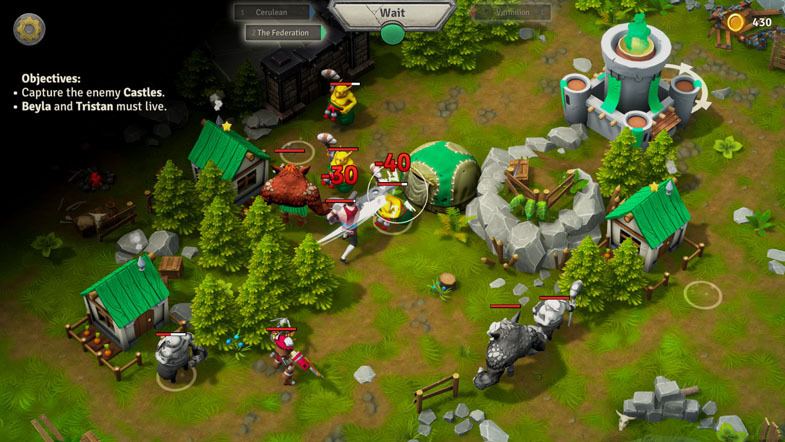 Exorder is a tactical turn-based strategy game from Fat Dog Games, its goal being to kill the opposing team’s king or queen by occupying a fixed number of locations. Players are introduced to the game via a linear, mission-based campaign full of road stops and enemies to kill, with difficulty picking up along the road. The story is presented through character dialogue and a short introduction preceding every mission. Following the story is for flavor only; it’s perfectly fine to click through the banter with your eyes closed, as there’s no role-playing or decision-making required. Turn-based can mean many things, but Exorder is the most straightforward kind. Troops can be moved in any order and an attack is the only move that ends a troop’s turn. 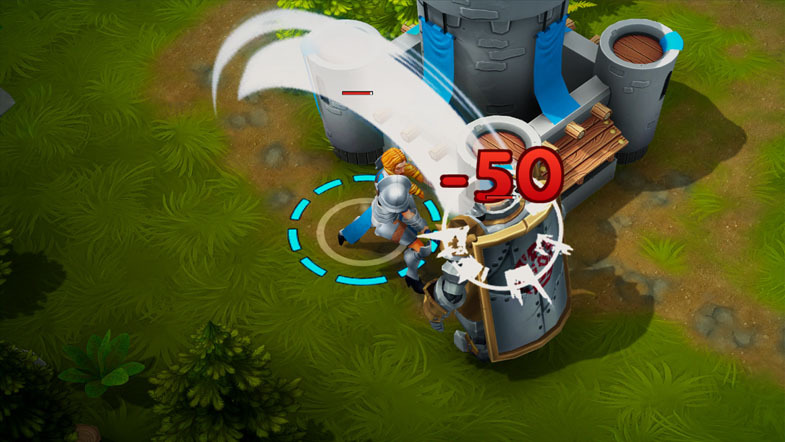 This means that you will usually move your guys into position first, before commencing the attack, ideally eliminating the target in a single turn. Since there is no fog of war and no fixed order in which the troops must move (which isn’t the case for games like King’s Bounty), focus fire on a single target is the go-to tactic. Thinking is required to correctly plot a path to the target, because units cannot pass through each other (unless they are pushed by a certain troop type called the Architect). While the tactical gameplay is one-dimensionally governed by the focus-fire doctrine, a considerable amount of variety is present for the troops and the maps. There are nine different troop types, plus the queen or king, all with widely different stats and abilities. These stats include attack, counter-attack, movement, and health, so it’s not overly complicated to figure out who belongs where on the battlefield. When it comes to abilities, there’s a lot to try and discover here. For example, Illusionists can create a mirror image of a friendly troop (think Heroes of Might and Magic’s Clone spell), which is especially useful on artillery troops like the Beetle who can shoot from three tiles away. Other troops mitigate damage, push allies or foes around, teleport to friendly buildings, etc. The maps are medium-sized and feature buildings that play different roles in battle. Houses generate income and provide healing for allies, forts allow the recruitment of troops, ballistas do devastating damage when manned by a friendly troop, and fountains heal any adjacent units. So... this all sounds very interesting! But how is the gameplay? Is it fun? Regrettably, it’s rather bland. While the presentation is colorful and the different parts are well done and functional, the overall experience leaves a lot to be desired. Defeating the AI opponents in campaign and skirmish modes felt like a slog, even with a vast superiority in troops and resources, and fighting through the enemies (who spawn in waves in the campaign) was by no means exciting or rewarding. There’s no feeling of accomplishment in beating the missions. There are next to no tactical or strategical decisions to make, and no rewards for winning efficiently or with style. You move everyone to the next target and attack. And again. And again. There is also no overarching progress to be made by leveling or gearing up your queen or troops. They don’t gain experience points, staying the same from the start of mission 1 to the end of mission X. While Exorder is very solid, that may not be good enough for some players. Still, there is hope. I didn’t get to try it yet, but the idea of playing this in multiplayer seems intriguing. However, it depends whether or not most games are decided long before the final blow. If there is a chance to make a comeback, the middle game or endgame has the potential to be a lot more interesting — otherwise suspense will be killed. In Exorder, getting the first kill and securing an income advantage of one house seems like it would put the opponent in a hopeless situation if everybody knows what they are doing. Easy to learn, hard to master? In comparison to games like Banner Saga: Factions, Battle Brothers, Warbanners, or even war games like Panzer Corps, Exorder seems lacking in creativity and content. In the best-case scenario it could be a case of easy to learn, hard to master, just like chess is. But chess doesn’t have this "move five pieces at once, and watch everybody take a swing at that poor chap" tediousness. Some improvements are needed, like faster UI, less fluff, fewer animations, and a more decisive endgame. Still, Exorder is by no means a bad game. If you like turn-based games, you should give it a try. There’s certainly some fun to be had exploring the synergies of troop types, and focus firing some overextended straggler never gets old, does it?